Should You Load Your Tax Refund to a Gift Card? A tax refund can be a financial windfall if you need money to shore up your emergency fund, pay for home repairs or you want to make a dent in your debt. 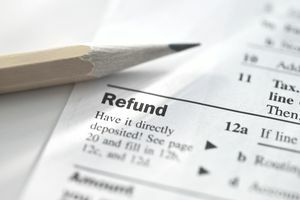 There's more than one way to receive a refund, including direct deposit, getting a paper check or with some tax preparers, getting a refund gift card or prepaid debit card. As you gear up to file your taxes, here's what you need to know about refund gift cards and prepaid debit cards. A refund gift card is simply a gift card that you load your tax refund onto. Two of the largest tax preparers, H&R Block and TurboTax, have offered or currently offer refund gift cards as an option for tax filers. Specifically, the gift card in question is an Amazon gift card. Essentially, when you file your return you're given the choice to use some or all of your refund to purchase a gift card from Amazon. As of January 2019, TurboTax discontinued their gift card program in lieu of a tax refund prepaid debit card program. But you can still take advantage of the Amazon gift card promotion through H&R Block. And, when you use your refund for the gift card option, H&R Block gives you a 5% bonus that's automatically added to your card. Ideal for spending refund on retail purchases. Refund can only be used for spending. The process of replacing the card can be inconvenient if it is lost/stolen. There are several reasons why someone might consider adding their refund to a gift card. Getting a bonus is obviously an upside because that's essentially free money. And, getting part or all of your refund loaded to a gift card may not carry any fees whereas you may pay a fee to set up direct deposit. Getting a refund gift card is also convenient if you were planning to spend your refund at the retailer the card is issued by anyway. Amazon, for instance, offers a wide range of products from books to electronics so if there's something you had your eye on, getting a refund gift card can make completing those purchases easier. The downside, of course, is that adding the money to a gift card more or less means you can't use it for any other purpose than spending. The easiest way around that is to create a refund budget, allocating some of the refund to the gift card and the rest to a checking or savings account. This way, you can spend some of the money while keeping the rest in reserve for a different purpose. Another drawback is that if you lose the card or it is stolen, you'll have to ask to have it replaced. Assuming your tax preparer agrees, you'll have to wait until they approve your request and mail the card out, which could be inconvenient. The advantage of choosing a prepaid debit card over a refund gift card is that you have more flexibility in how you spend. If your card has the Visa or Mastercard logo, you could use it to make purchases anywhere Visa or Mastercard are accepted. Depending on the card, you may also use it to make ATM withdrawals. Some cards can also come with a cash bonus when you load some or all of your tax refund. The biggest disadvantage with loading a tax refund to a prepaid debit card is that can get expensive if you're paying load fees to add money, monthly maintenance fees or inactivity fees. And again, if the card is lost or stolen, you'd have to deal with the headache of having it replaced. Of course, if you don't have a bank account, a prepaid debit card may be the most convenient option for receiving your tax refund. You can spend with it and pay bills as needed. But, if you want to avoid the fees, it may be worth it to consider opening a bank account to get your refund via direct deposit. At the end of the day, your goal should be to hang on to as much as your tax refund as possible. Considering the pros and cons of refund gift cards versus prepaid debit cards versus direct deposit to a bank account can help you decide which one is right for you.